After I read and reviewed Black Dog, the first in the Ben Cooper & Diane Fry crime series, I just couldn't resist buying Dancing with the Virgins, the sequel. Then, I found two more at the library (and not caring much for reading in order, I read them.) 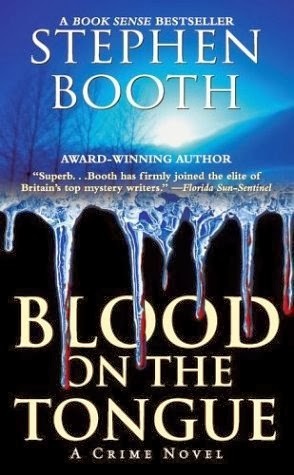 Blood on the Tongue by Stephen Booth is the third book. Now, having already read two books out of order, I can say with certainty that the books provide enough background information to work as standalones. Then again, I can't think of a reason for not wanting to read the whole series! Summary: The weather is cold and the clues no warmer as Peak District detectives Ben Cooper and Diane Fry tackle a medley of mysteries - each one knottier than the last - in English author Stephen Booth's haunting third novel, Blood on the Tongue. The unidentified body of a dead man has turned up on a frosty roadside. An abused woman is found curled in the snow on nearby Irontongue Hill, an apparent suicide. And there's the lingering puzzle of a Royal Air Force bomber that crashed into Irontongue back in 1945, killing everyone on board except for the pilot, who reportedly walked away from the wreckage... and was never heard from again. With leave and sickness decimating the ranks of the Edendale police force, all hands are needed to solve the modern deaths. But constable Cooper finds himself distracted by the World War II tragedy, in large part because of a beguiling young Canadian, the granddaughter of that missing pilot, who's come to Edendale determined to clear her ancestor's name. My thoughts: The characters, the wonderfully fleshed out characters, were the highlights of the book for me. I could once again instantly picture the nice, perceptive (albeit slightly awkward and generally confused, around Diane Fry, anyway) Cooper and the (still) sort of cold outsider Fry. But they are the main characters of the book, you'd expect them to stand out. But - I loved the many officers in the police department, the Polish community of Edendale, the survivors of the war and the avid collectors of war memorabilia and those others who found their way into the story and got stuck there without ever meaning to nor really deserving to; every single character felt so real and alive. The intermingling lives made all the concepts of flat characters and round characters and foils just vanish right out of my head - they were real people for the time it took me to finish the book and then some. Cooper is the kind of guy anyone would like and Fry the kind of woman you're bound not to, but together they just make the perfect, if a little odd, team. Diane was a little less annoying in this book than usual, or maybe I am just warming up to her. Either way, I particularly liked the typical Cooper and Fry moments in Blood On The Tongue. A lot depends on protagonists in any book, and this series revolves around the perfect pair! Another specialty of this book was all the work that went into creating the right atmosphere. For every scene. What I loved was it was not just about detailed descriptions: the ice and the chill were amazingly described. But then there was that part about Cooper's squelching wet shoe that brought the feeling to life. The setting is obviously partly fictional and partly real and to someone who has never been there (to the real places) the attraction was that it was hard to figure out just what was made up. And it was all so vivid that I actually wished it weren't not-real! Then there were those little well placed snippets of insight (which I just had to highlight - so by the end there were yellow boxes glaring at me from every three pages). It was one of the worst sounds you could ever hear - the ticking of a clock in an empty house after its owner had died. It was a reminder that the world would carry on just the same after you had gone, that the second hand wouldn't even hesitate in its movement as you passed from living to dying. Tick, you were there. Tick, you were gone. As if you had never mattered. It was a sound that struck straight to some primal fear in the guts - the knowledge that time was steadily counting you down to your own death. If I had to point out a problem I had with the book, and I don't want to, it could be that the book was a little slow, a little confusing at the beginning, and it took me a little while to get completely drawn in. But once I was engrossed, making time to read it had priority over all my daily plans. Fact is, this is definitely one of those reads that I'd recommend to anyone who'd care to listen, and that means, you should read it too. Get it right here! I'm not your biggest expert in science fiction, not having read most of the bests. So undecided as I was about what to read for The 2014 Science Fiction Experience, which has begun already this month, I downloaded all the free science fiction short stories and novellas available on my phone. So far, I've read three. 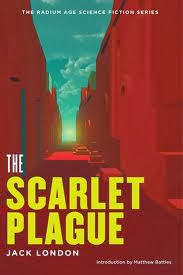 The Scarlet Plague by Jack London: This is supposed to be a classic dystopian; the book description called it a post apocalyptic fiction novel. To me, it seemed less like a novel and more like the basic framework of a novel. Set in the year 2072, the story follows an old man, Professor Howard James Smith, the only survivor from the old world and his savage grandsons. The old man tells them the story of the scarlet plague, which, ironically, struck the world in 2013 and wiped most living creatures off the earth. The savages listen to the old man's detailed descriptions with disbelief, dismiss his complex language as the ravings of a mad man as the once Professor Smith mulls over the fate of civilization. 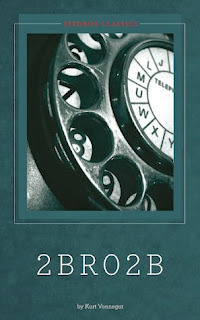 This book made hardly a story, narrated mostly in flashback. If it really were one of the first dystopians ever written, I can understand the charm. It is ingenious and does make you wonder. But the fact is, now, for the most part, it seems like a dull narration, put in contrast with many post apocalyptic stories I really like. It is too short to be called a novel (made me wonder if that slim Call of the Wild copy of mine is in fact, unabridged) and recommended, I guess, only to fans of the author. 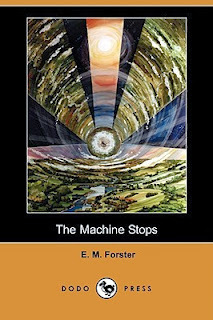 The Machine Stops by E. M. Forster: This is a short story set in a future world where people live wholly underground with everything they need provided to them in their solitary cells. The only contact with the surface of the earth is during flights, but people prefer not to travel unless absolutely necessary, and when they do, they're mostly uncomfortable and nearly always, scared of the view. The only activity people do is share their ideas through machine messages. This Machine, which runs their lives, has slowly gained a mystical, godly image and people have begun to revere it. One of these people is the main character, Vashti, who is invited by her son Kuno to visit her, out of the blue. He turns out to be a rebel and Vashti's reluctant visit leads to her shocking discovery that Kuno has been to the surface of the earth, illegally. If all this sounds just too obvious for your liking, consider this: the story was written in 1909. I know quite a few people who didn't like Howard's End much, but I seem to be very comfortable with Forster's writing style. For a book written more than a hundred years ago, it is quite perceptive of the future and the characters and interactions so aptly and simply put will certainly strike a chord with today's readers. If our machines stopped, would we be able to survive? In a few pages, the story makes you rethink a lot of your basic assumptions about the world and yourself. You can read it online here. 2BR02B by Kurt Vonnegut: 2BR02B, with the 0 read as 'naught', is a very short story, a brilliant satire about a future where they've found a cure for aging. What would happen if, like in this new world, the government took up the responsibility for administering all births and deaths? It goes like this: for every person to be allowed to be born into the world, one person has to volunteer to die. This story was very Kurt Vonnegut. Dark, hilarious and abrupt. It took me only a couple of minutes to read this, it was over even before it really began and I found myself chuckling at the end! Basically: I loved it. Go read it here. I'd say this was a good start to the challenge, and I mostly want to read short stories and novellas for now. 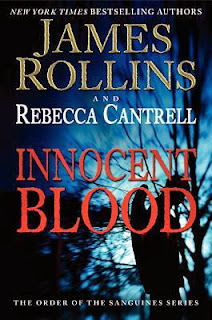 Innocent Blood by James Rollins and Rebecca Cantrell has to be the most engrossing, thrilling, fast paced book I have read this year. It is action packed and so, so interesting. The book is the second part in a series titled The Order of the Sanguines, but offers enough background info, detailing on the events of Book #1 (The Blood Gospel), to work as a standalone. It is like a paranormal version of a Dan Brown novel, with vampires, angels and prophecies. Summary: A modern scientist, a highly secret eternal spiritual order, and a terrifying power must join forces to bring down a ruthless and cunning enemy and prevent the Apocalypse. An attack outside Stanford University thrusts Erin back into the fold of the Sanguines. As the threat of Armageddon looms, she must unite with an ancient evil to halt the plans of a man determined to see the world end, a man known only as Iscariot. My thoughts: People judge vampire fiction far too quickly these days. This book is neither young adult, nor paranormal romance nor anything that would make you roll your eyes and go all skeptic. In a word, Innocent Blood by James Rollins and Rebecca Cantrell is awesome, so don't dismiss it as just-another-vampire-related-book. What I liked: The standouts were: the uniquely sinister take on vampires; the characters picked out of history and mythology, I specially liked the Blood Countess, Elizabeth Bathory; the character development despite the swift pace; the adventure spanning over the world and the ages; the attention to detail. The story was horrific, thrilling, tragic and (here's a rarity in this genre) quite insightful. And the touch of science fiction, with those ingenious mechanical insects capable of fatally poisoning vampires: wow. The book has left me in complete awe. That it is part of a series and there's more to come is the icing on the cake. What I didn't like: Nothing. The book was as close to perfect as can be! I give it a four star rating, because, not having read the first book, it took me a while to get into context. Some terms were unfamiliar; like the strigoi - the vampires, the Sanguines - the reformed (sort of) vampires priests or the blasphemare - these animals turned into nightmarishly strong monsters after being infected by the blood of the strigoi. I also had to read up on a lot of the Christian elements and the Biblical references, though they were pretty basic and the extra reading was just for me. I don't know if the themes could be construed as offensive by religious readers, but they were very intriguing and as far as I'm concerned, amazingly unique... What I'm trying to say is, READ IT. After a very unwanted two-week break from blogging, this week will be flooded with reviews. Some time last week, this book finally arrived on my doorstep (there were some issues, I live in an annoyingly inconspicuous neighbourhood, that no one ever finds.) I finished Love and Lokpal in one swift sitting, and if not anything else, it certainly made for a well spent afternoon! 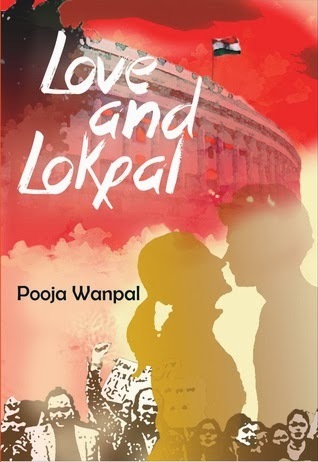 Love and Lokpal by Pooja Wanpal has a pretty self-explanatory title. That's just what the book is about: it is a college romance with the whole frenzied Lokpal Bill movement as its backdrop. Summary: Shlok Kulkarni, an architect by day and an Assassin's creed junkie by night is being bombarded with eligible girls by his matchmaking mama. In a bid to escape her and maybe check out a few hot girls while he’s at it, Shlok flees to Delhi, where a massive protest for the Lokpal Bill has been building up. Kaveri Gokhale has been searching for a cause her whole life. When the winds of the Lokpal blow through the country, she eagerly catches the next train to Delhi to witness history. When Shlok runs into Kaveri at Jantar Mantar, the sparks are undeniable. As their relationship blossoms, Kaveri discovers a dark secret that leaves her devastated... and endangers the fate of billion others. Will Shlok and Kaveri’s love wither or will it withstand the uncertainties of the corrupt politics? Can love truly conquer all ideologies? My thoughts: I have mixed views about this one. The one question I ask myself when I am on the fence about a book is if it has a point. When it comes to Love and Lokpal; for all the minor irritants, the book is hardly pointless. What I liked: You know how some books have like a wide, epic-sy scope? This book has the exact opposite, and that is a good thing. Having our heroine fight for an apparently huge, inspiring cause while still bristling over boyfriend troubles has an incredibly homey feel to it. The story sticks, mostly, to the every day reality of a young Indian. The characters are lovable stereotypes and the situations they're put in are quite easy to imagine and relate to, from the college politics and twenty-something colleagues with their crazy boss, to a typical mother trying to trick her son into an arranged marriage. The relationship between Shlok and his sister has a cozy, personal quality that suggests some (welcomed) borrowing from reality, as do the college friendships. If the writing weren't as funny, I have to say, the book would have been dull. The language is at once mature and quirky, the descriptions are vivid and detailed. The protest in Delhi is described with much fervour and it has that ounce of dramatic passion that characterizes Kaveri. You can tell the author has done her research, without there being any unwanted information dumps. The love story itself is sweet and never overly mushy. And the point of the book? The answer to the question posed on the back cover, "Can love truly conquer all ideologies?" That's something I'd rather not spoil; except perhaps to say that the story concludes on a nicely re-conciliatory note rather than pushing any sort of agenda. What I didn't like: The biggest problem I have with the book is that it just doesn't manage to fully explore any of the issues it so promisingly brings forth. It is just too short a story, wrapped up much too quickly, before it even has a chance to really begin! As a consequence, the relationships between many of those admittedly nice characters haven't been allowed to flesh out either. Carrying the story a little further, and stretching out the beginning would have made the plot a lot smoother, the ending a lot less abrupt. There are few editorial errors, but the tenses frequently go kind of wonky and the switching narratives seem a bit repetitive and unnecessary - I think the book could have worked just as well with a single third person perspective. Overall, if you were a part of or religiously followed the whole Lokpal protest movement business (which is more than I can say for myself), you would find heaps to relate to. If you like cutesy college romances, this one is perfect. For me, the fact that Love and Lokpal by Pooja Wanpal reads like a debut is a teeny bit of a problem. She should write another book, and I have a feeling I'd like the next one more.